We all know that SSD’s are fast, but how fast are they exactly compared to each other? When I say that I’m talking about the different formats they come in, like your classic 2.5 or an M.2 format ones one, which are nowadays being formed as NVMe M.2 drives, basically exclusively, with few M.2 SATA models still roaming around. That first type of M.2 SSD’s, the NVMe ones, are also using PCI-express lanes for a greater bandwidth gain, which then paired with up-to-date NAND flash chips and controllers easily surpass performance figures of a 2.5 drives. So, with having this in mind, it’s easy to guess in which direction would an NVMe vs SATA fight go, but it’s not all as it seems. Why can’t a SSD NVMe vs SSD SATA battle be in favor of SATA? The thing is that even though a 2.5 solid state drive can carry NAND flash which performance could be similar to those seen on M.2 drives, some even use the same ones, the SATA interface still remains the main problem, or to be precise, it’s theoretical bandwidth of just 625 MB/s, which is way an NVMe vs SATA comparsion in theory wouldn’t go well for it. This is why we’re transitioning over to M.2 standard, which in combination with NVMe protocol and use of PCI-express lanes, can deliver throughput of up to 16 GB/s in its, for now, most common 3.0 revision and with the full electrical configuration of x16 lanes. Unfortunately, the SATA interface is still a go-to choice if you plan to have more than two or three drives, thus limiting your high-performance options, since there’s so much space on a motherboard, or lack of it, which can be reserved for putting an M.2 slot. I hope we will soon see a more concrete alternative that’s equally practical as SATA interface, although, to be honest, the M.2 format as it does fall behind it, or maybe we see a greater push for the U.2 standard. Anyways, let’s get back on track. The drive which I’ve used for this test today is the new Toshiba RC100 model, which aims to bring the high-end performance of a typical NVMe M.2 solid state drive to a broader user population on a count of its more affordable price. It’s a step in the right direction, one that was expected to happen sooner or later in this realm. 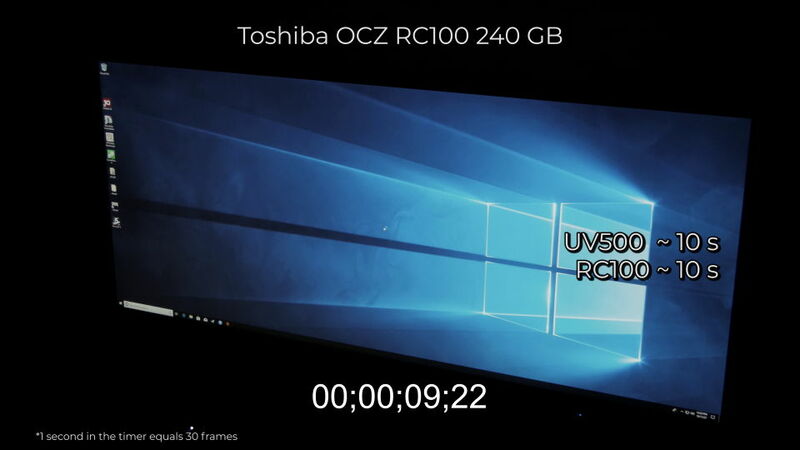 Since I’ve just recently done a review of Kingston’s new UV500, which is your run of the mill budget representative of the 2.5 SATA solid state drives, I’ve figured why not compared it with Toshiba’s OCZ RC100, as it’s also in a way a budget representative of its segment, basically one of the first of its kind – that being the NVMe M.2 SSD segment. Obviously, the SATA one trails behind in terms of raw performance output due to it interfaces limitations, but we’re more interested in seeing the difference in real-life, day-to-day user-experience. So, let’s check out that NVMe vs SATA solid state drive comparison. I’ve put a fresh copy of Windows 10 on the Toshiba RC100, all nice and tidy, updated everything, filled it up pretty good with games and other software, almost to the top, and I was good to go. Looking at the numbers and stopwatch figures, in terms of Windows boot time and loading games, there was little to none difference between them in this comparsion. As you can see, it basically boils down to a measuring error. Boot to Windows was in both cases done in around 10 seconds, and measuring loading time of three different games resulted in a pretty dead even race, as shown here. This is pretty much what I expected getting from a SSD NVMe vs SSD SATA comparsion. Is NVMe really worth in the end based on this SDD M.2 vs SSD SATA battle? The only substantial difference in a NVMe vs SATA SSD showdown can be seen during for example your plain file transferring, but that’s not your ordinary user case scenario, seeing someone transferring files from one folder to another on a daily basis, being it if you have another high-end NVMe drive to transfer to or from, cause otherwise you’ll have a bottleneck, while the next tangible and really applicable difference can be seen in content creation suits, like the Premiere Pro or After Effects, where the between these two drives grow apart when it comes to loading or scrubbing footage. I could say that I’ve expected a turnout like this one when comparing these two interfaces and formats since they are pretty straightforward products. They store your data and have a certain level of performance, and that’s pretty much it, so with picking up an solid state drive from budget, mainstream or even from the prosumer segment, you’ll basically get the same result when we talk about your user experience in a standard PC setup. Expect maybe the difference in the warranty length, or if for example some model or brand has a really bad reputation in terms of being reliable, there’s hardly a reason to go for a drive that has a price premium on it, even though it brings in better raw synthetic performance.Revesiting this topic down the line, I’ll dobut it would yield any substatial difference in this SSD M.2 vs SSD SATA showdown, at least when it comes to everyday user expriience, cause software and games that you’re loading comes in small chunks of data, which can easily be read and turnovered in one second of read pass, even with a regular 2.5 solid state drive. Yes, there are some scenarios and users who can benefit from it, but the majority of us will be more than happy with a more value-oriented 2.5 SATA SSD model or greater capacity as opposed to getting a similarly priced higher performing drive. In the end, now that everything is laid out, you can decide what you will get, cause you’re the one who knows what are your precise needs in terms how you use your PC.